It was just about closing time one evening when a whirlwind came flying into the shop. Dr. Patricia Mihaly Nabti was in town for a short while and had just discovered Reach And Teach on the web. She asked if she could meet with us for a short while and, remembering the lessons of hospitality we had learned in places like El Salvador and Afghanistan, we of course said yes. Dr. Nabti had a book that she wanted us to know about, focused on service learning, an area in which we have a great interest and for which we have some terrific resources, including the Youth Community Service (YCS) leadership curriculum developed by our friends at YCS in Palo Alto, and the Complete Guide to Service Learning by Kathryn Berger Kaye. After going through her story and telling us about book for around 45 minutes, I promised to take a good look at it and get back in touch. At first I was somewhat concerned that a good portion of the book reflects programs and students in Lebanon, and I wondered if those would translate well to the United States, Canada, and other places where our partners in peacemaking lived. I found instead, that it was the very multicultural nature of the book that is one of its greatest strengths. A teacher or administrator or program leader, I believe, will actually be inspired by what's possible all over the world, and with the comprehensive toolkit Dr. Nabti provides in this book, will be able to put together effective, meaningful, creative, and totally engaging service learning programs. The book can be used both as a comprehensive introduction to service learning or as a cookbook of recipes for successful service learning projects. Scroll down to see these in more detail below. The book empowers students to volunteer and to plan and implement their own service projects under the supervision of responsible adults. It provides guidance to the different stakeholders (administrators, teachers, parents, and community partners) about how they can contribute to this empowerment. 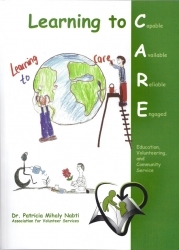 The premise of the book is that students can learn to care. They can learn to develop the genuine feelings of concern for those in need and the problems in society that need to be address; they can learn not to be indifferent and irresponsible; and they can learn how to actually make a difference through commitment and effective action. The term care is used in the book because it contains within it an expression of both feeling and action. A person who truly cares about someone or something is compelled to act on that concern, to care for or take care of what s/he cares about. Care also stands for the four attributes of a good volunteer: Capable, Available, Reliable, and Engaged. Through volunteering and community service students can increase their academic and interpersonal skills, knowledge, appreciation of human diversity, and sense of social responsibility while they provide genuine service to their local community, their society, and the world as a whole. And adult volunteers for schools can improve the schools while providing important role models for students. Examples in the book are primarily from schools in Lebanon, but there are also examples from the United States, Canada, Australia and elsewhere in the world. The book is illustrated with 50 student drawings and 140 photographs of school service activities. It includes over 300 inspirational quotations. In addition, its rich appendix has guest articles and many other valuable resources to support school service programs from sources worldwide. School-sponsored projects are a great way to introduce community service into a school before any formal program is established. Such projects are outside of the regular academic program and do not have an organized structure or a membership that continues over time. A school can sponsor a service project for the whole school, a division (elementary, intermediate, secondary), or one grade or class. A school may be invited to participate in a project organized by a non-governmental organization, or it may take the initiative to commemorate a service day like World Health Day. Many schools have clubs and teams, some that are service-oriented (Environmental Club, Human Rights Club) and some that are not (Sewing Club, Chorus, Chess Club, Basketball Team). This option provides ideas about how all extra-curricular clubs and teams in a school can engage in service projects at least once a year. Service incentive programs are structured programs that encourage students to become involved in volunteer service by giving them some kind of recognition or award (honor list on a public bulletin board at the school, a certificate, or a notation on a student’s diploma). Mandatory service programs are programs which ensure that all students in a school eventually engage in community service by making it a requirement for graduation or for promotion from one grade to the next. Service-learning is a method of teaching which integrates service into the curriculum of a school in a way which enhances learning while providing genuine service to the community. It connects service to such diverse subjects as math, history, biology, computer science, art, and literature, and can be done at any grade level. While all of the other options are for students, this option discusses how adults can volunteer for the school, thereby expanding the effectiveness of administrators and teachers, while providing students with role models of adults engaged in community service. This does not exclude the possibility of the students, themselves, volunteering for their own school, but that is covered in the other options. A school may engage in only one of these options, some of them, or even all of them, although developing such a comprehensive service program should be done gradually. The six different options are often developed independently. It is useful, however, to have at least a loose coordination of all school service programs to ensure the quality and support needed, and to share information about community contacts and resources. Dr. Patricia Mihaly Nabti is the founder and director of the Learning to CARE Institute. Dr. Nabti was born and raised in Santa Rosa, California, primarily of Hungarian heritage, and is a Lebanese citizen through her husband, Dr. Michel Georges Nabti. She has lived in Lebanon since 1992. Beginning in 2012, she plans to spend eight months each year based in Beirut and the other four months based in Palo Alto, California.